When you’re craving fried chicken but don’t want to deal with the frying, Oven Fried Chicken will satisfy your craving – minus the excess fat. Fried chicken is a delicious finger lickin’ food, but it can also be very messy and less than healthy. While we love to indulge in our easy Classic Deep Fried Chicken, sometimes it’s nice to have some lighter fare to fill those cravings. This oven fried chicken does just that. You get the flavor and crispiness of regular fried chicken, but baked in the oven. 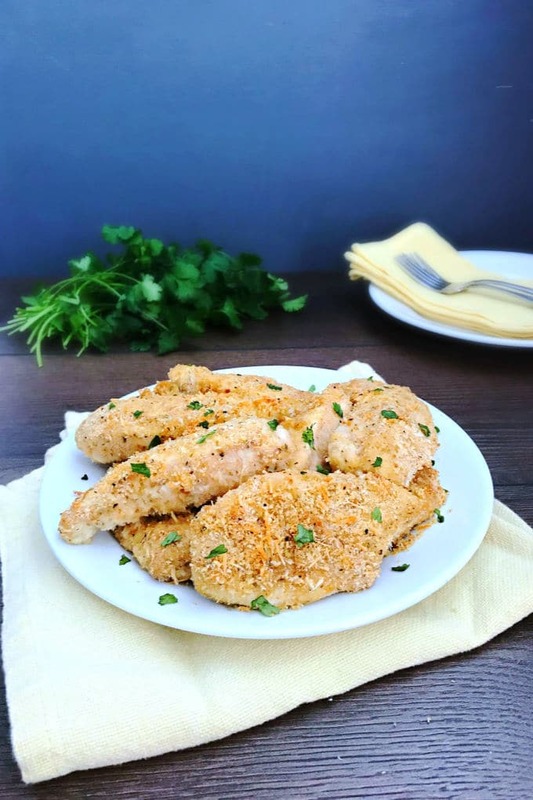 One of our secrets to this is to brush our oven “fried” chicken with olive oil before breading it with a panko and parmesan cheese mixture. Then we put it in the oven to bake and crisp up. Our second secret is in how we bake it. Instead of baking the chicken right on the sheet pan, we put a wire rack between the two. This allows for nice, even baking on both sides of the chicken. Sure, you don’t have to use the wire rack – but then you’d have to flip the chicken over half way through – adding an extra step. And who wants more steps when you can have crispy juicy oven fried chicken in 30 minutes? Preheat oven to 400°F. Line a baking sheet with a silicone mat or parchment paper then set a wire rack on the sheet and spray with nonstick cooking spray. Pour the olive oil in a small bowl. In a separate bowl, whisk the egg whites together. In another medium bowl, combine the panko, parmesan cheese, Italian seasoning, salt and pepper. Pat chicken tenders dry with a paper towel then brush them with olive oil, coating evenly. 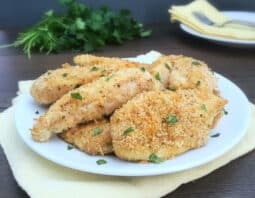 Dip in the egg whites, then dredge each chicken tender in the panko cheese mixture, gently pressing it onto the chicken, then place on the prepared wire rack/baking sheet. Drizzle any extra olive oil over top the chicken tenders. Bake for 20-25 minutes or until the chicken reaches an internal temperature of 165°F on an instant-read thermometer. Remove from the oven and allow to rest 5 minutes before serving.